To begin building the gd_snp table, convert the first of the datasets containing SNPs (with added reference column) to a gd_snp table. In the Convert Formats section we want the "pgSnp to gd_snp" tool. 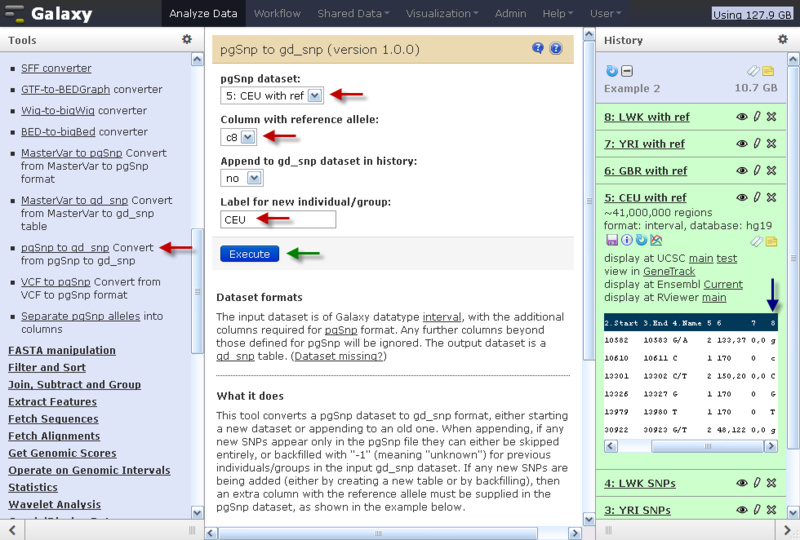 For the pgSnp format file, select the dataset "CEU with ref". Then to get the reference allele column, open that dataset in the history panel. You can see that the reference allele is in the eighth column (blue arrow), so select "c8". For the this step we will not be appending to a gd_snp table but starting a new one. The label will be added to the metadata so it can be seen and used by other tools. Click Execute (green arrow) to run the tool.